The hills are covered in melting snow and lower down rain and wet snow has been falling for 24 hours. Some places are experiencing flooding. Yet, the biggest story is that all over Ireland water has to be rationed because it's running out. Incredible, ain't it? The problem is pretty straight-forward: Ireland is awash in leaky pipes, if I can use such language. Some of the cities' water pipes date back to the 19th century and those pipes are notoriously leaky. Some of the pipes in Ireland's new suburbs are also leaky due to Ireland's notoriously lax building codes being ignored. On top of all that, in many places the pipes have burst due to the 'extreme cold' the country has experienced. That extreme cold consisted of a couple of weeks of temperatures below freezing (mostly). We're not talking about weeks of sub-zero (Fahrenheit) temperatures. I'm not entirely sure what it is about Irish pipes that they can't withstand temperatures that big chunks of Europe & North America experience annually with no problems at all, but there you have it. Our pipes are bursting due to the cold. A failure to bury the pipes deep enough in the ground is the only rational explanation I've heard so far. The fact that pipes have been bursting has only served to encourage other people to waste water by leaving their water running around the clock (water is unmetered here). Now, just to be clear, it's not that our reservoirs are out of water, but rather the water that has been treated and labeled ready for human consumption is being lost before it arrives in the homes and businesses throughout the country. 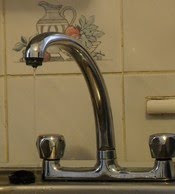 We can't treat all the water fast enough to compensate for all that's being lost through the leaking and broken pipes. Rivers are bursting their banks as I write this, but regardless, our pipes have created a water shortage. Large areas of the country have no water or a very limited supply. The rest of the country is only experiencing a fall-off in pressure and being asked to conserve, conserve. It's almost laughable, really. Ireland has few natural resources that it can claim to have in abundance, but water is an exception. This little island is a large sponge. Water is simply everywhere. It shouldn't be so difficult a task to get water to people's houses. It doesn't matter, however. The deluge goes on, but we're asked not to run the dishwasher ... maybe avoid using the washing machine too ... Do you really need to shower? ... Surely, one cup of tea is enough for you? 'Water, water everywhere' and all that was never so apt as today across Ireland.